My journey to balancing work, marriage and being a mom! Temper tantrums. Everyone has them…babies, teenagers, adults, the elderly, you name it! They come in different forms and various terms (frustration fits, temper tantrums, toddler tantrums, hissy fits, crying fit, conniption fits, nervous breakdown, meltdowns, the list goes on), but it all usually comes down to the same thing: I am frustrated, I am angry and I am expressing my frustration and anger. While this is not the case for every individual (some tantrums are the result of medical illnesses, etc. ), I am speaking generally and in ‘tantrum slang format’ (i.e. using the word tantrum to encompass all levels of anger and frustration expressions with regards to children) which I realize is not medically correct, but I’m not a doctor so let’s continue! 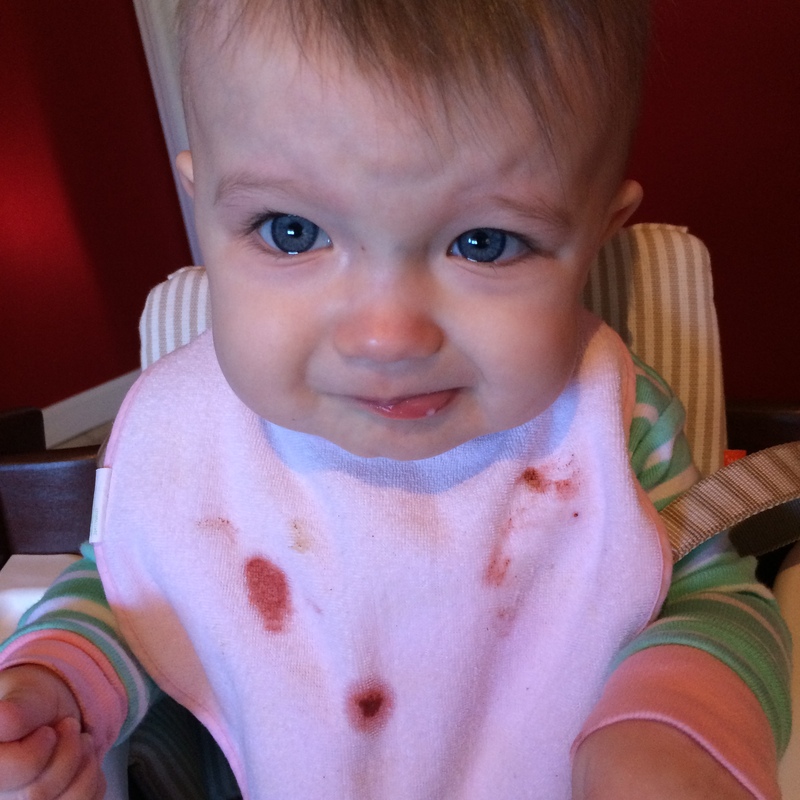 This is my daughter’s face after a crying fit in her high chair. As you can see, she’s clearly still upset to which I snapped this picture then immediately comforted her (I know, bad parenting on the picture part!). I am told by the pediatrician that this is the age when babies will express their distress or frustration based on the situation. These can be called ‘frustration fits’ but I know that many people interchangeably use ‘temper tantrums’ or ‘complete meltdowns’ despite the child’s age (as I am doing here). So, why was she upset? Well, she couldn’t get the puffs in her mouth. She got a few on her own so I stopped putting them in her mouth for her. Once she couldn’t get the others in she started crying, then arching her back moving up and down and then yelling (yes, all while strapped into her high chair). I gave in and fed them to her. She still cried. It was time for her nap so I put her down. She cried some more. She fell asleep ten minutes later which is a new record from the time it usually takes her to go down these days (about 30 minutes!) and I fell on the couch in my own distress. I think she was just overly tired…or maybe she wasn’t…maybe she was just having a tantrum. I know she is technically ‘too young’ to be having an actual temper tantrum (they say it doesn’t really happen until they’re around one years old) but whatever this expression of dislike is, I DISLIKE IT! If she doesn’t like something she will let you know. She will move and kick and arch her back and cry and yell. She will literally THROW A FIT (and a few toys). My husband says “she’s definitely your daughter.” I thank him for the compliment with my go-fly-a-kite grin. It’s not my favorite phase that she’s going through, but it’s all part of her learning, growing and coming into her own. In the moment, tantrums are the worst. I actually want to start having one of my own when she is! But then I have to stop and think, this poor little peanut, she can’t communicate any other way. She can’t talk to me and tell me what’s wrong or why she’s upset…this is all she can do. She is a baby. She has off days. She gets frustrated and angry just like everyone else does. She is human. And what am I? I am her mother. I am here to comfort and console her, to guide and nurture her. Sure, I am also here to discipline and teach her, but above all, I am here to love her. I am here to give her all the love that she needs. In this moment, this tantrum-fitting moment, I am not here to judge, to get frustrated with, to get angry at, to get annoyed over or any other part of me that wants nothing more than to pull my hair out and have a large glass of wine (you know, that whole bottle in one glass kind). I am here to be her mother, and that means unconditional love, support, compassion and understanding. We may not have these unconditionals for many people in our lives, but we must have them for our kids. We must. Because if we don’t, who else will? Who else will give them all they need to survive in this world? To be raised right in this world? To truly understand what it means to be loved in this world? She had a ‘temper tantrum’…and you know what I did (yes, I took a picture, but after that!)? I loved her. I loved her and I hugged her and I told her it was going to be okay. She squirmed and she cried but I still gave her my love because sometimes, no matter how old we may be, love is all we need. We all have tantrums, we all break down at one point or another, and when we do, it’s nice to know you have one person who will always be there to love you. I hope my daughter knows she forever has me. My name is Renee. I am a mother, wife and business owner (Let’s Get Chalky). This is my journey to balancing work, marriage and being a mom!